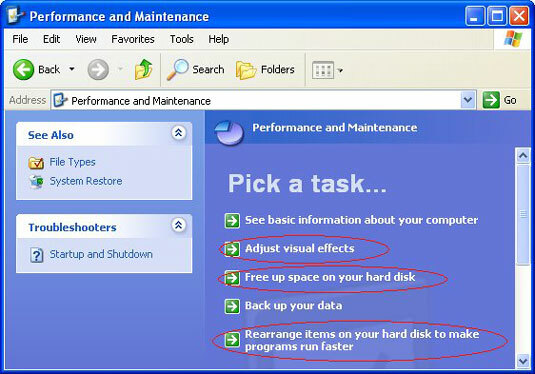 You can easily fine tune the Control Panel’s Performance and Maintenance tasks in Windows XP. To begin, click the Start menu, choose Control Panel, and click the Performance and Maintenance category. Then, complete these tasks to speed up your computer and free up more storage space. Adjust Visual Effects: To speed up Windows, turn off some of its visual effects — the little shadows around icons and menus, for example. Free Up Space on your Hard Disk: To free up disk space, the Disk Cleanup program removes unneeded leftovers from Web browsing, empties your Recycle Bin, and deletes temporary files. Rearrange Items on your Hard Disk to Make Programs Run Faster: In a process known as defragmenting, Windows rearranges your hard disk’s data for faster access. Clean your mouse: Turn your mouse upside down and scrape off any crud stuck to the bottom. With a brush, remove any hairs or dust stuck to the glowing optical sensor. If your mouse has a roller ball, remove it, and clean its rollers with a cotton swab and some alcohol. Clean your monitor: Spray glass cleaner onto a rag, then wipe the screen, being careful not to drip any liquid in the area where the glass meets the plastic case. Clean your keyboard: Shut down Windows, turn off your PC, and unplug your keyboard. Then blow all the dust out from between the keys using a can of compressed air. No compressed air? Then a vacuum cleaner with a brush will do the trick. Spray some household cleaner onto a rag and remove any goo sticking to the keys or the keyboard’s edges.